The Grill. The star of the show. On second thought, is it really?? I would venture to say, and you would too, that the food is the star of the show or should be anyway. 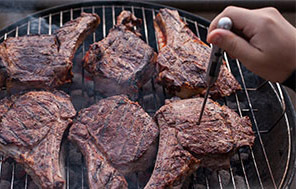 To keep the food the star – always start with a clean grill and follow the tips included below. When grilling, marinating is always a nice touch. It adds flavor to the food and can aid in tenderizing as well, making for a pretty darn good steak. Marinating should always take place in the refrigerator – not on the counter. Remember that Danger Zone we’ve talked about in the past (41F – 140F). If you want to use some of the marinade as a dip or basting sauce later, set aside a portion before adding raw meat, fish or poultry to it. Never re-use the marinade from raw meat, fish or poultry unless you boil it first. For best flavor and ultimate safety, it is best to just save a portion of the marinade. Once the marinating is complete, it is time to get out to the grill and fill the neighborhood with wonderful aromas! Keep in mind the utensils and that plate used to carry the meat out to the grill should not be used for the cooked foods. These items should we washed in hot soapy water followed by a clean water rinse prior to using again. As the item(s) are cooking, gather a clean serving plate, tongs and your best kitchen tool yet – that’s right – the food thermometer! A food thermometer should always be used to check for safety and doneness as it is the most reliable method. 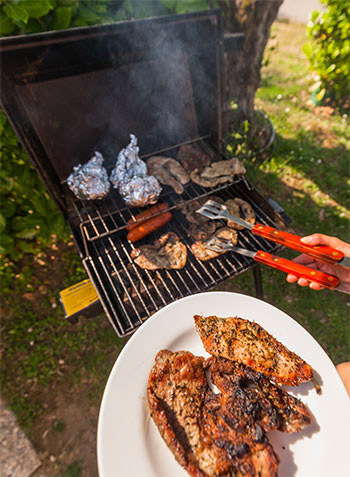 Meat and poultry cooked on a grill often brown quickly and may appear done on the outside, but still may not have reached a safe minimum internal temperature to kill harmful bacteria. Use the temperature chart below as your guide. Did you know – one out of four burgers turns brown before it reaches a safe internal temperature? Hamburgers (ground beef/pork) 160 °F. Serve hot, grilled foods immediately to keep them the star of the show. Again, it is very important to put cooked foods on clean plates that were not used to hold the raw meat or poultry using clean utensils. (This cross-contamination is a prime cause of summer foodborne illness.) Also another key factor in foodborne illness is the holding temperature. Perishable foods should be consumed within two hours, one hour in warm weather (90°F +). Discard if these limits are exceeded. After enjoying your delicious grilled creations, it’s back to the grill for some clean up. If it is not the star, it should at least shine for it’s award as best supporting role! Follow the manufacturer’s instructions for best cleaning results and keep a watchful eye out for any bristles that may have come loose from the cleaning brush. You do not want to end up with these as a surprise in your next meal! Enjoy making your food the star of the show! I wish you SAFE and Healthy grilling!